The water stick insect, Ranatra linearis, is a very distinctive species found in lakes and ponds with thick emergent vegetation. Overwintered adults mate in April and eggs are laid in row on the stems and leaves of water plants. Development of eggs takes three to six weeks depending on temperature and the nymphs pass through five instars, taking about two months to become adult. The water stick insect is a predator, feeding on a wide variety of small animals, including tadpoles, which it grabs with prehensile front legs. It swims using the mid and hind legs as oars and can disperse by flying in warm weather. As in the water scorpion, Nepa cinerea, the long tail functions as a breathing tube. The map is based on records from NBN Gateway, with yellow dots showing pre 1990 records, reds dots 1990 – 2015 records and red on yellow dots overlapping records. 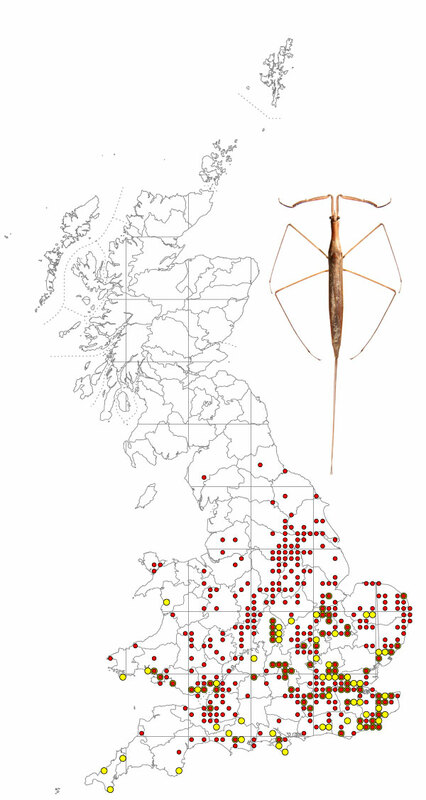 Ranatra linearis is widespread in middle and southern England but scarcer in the far west, Wales and the north and is absent from Ireland. It has spread further north over the last 25 years or so, perhaps in response to climate warming. Southwood & Leston (1959) describe the northern limit of R. linearis as a line from Norfolk to South Wales. Ranatra linearis is about 4 cm in length, 7 cm including the tail. Identification of this distinctive species is straightforward.